Phuket Fantasea Tour is the most talked about show in Phuket. The Fantasea show is suitable for all ages and is popular with all nationalities. 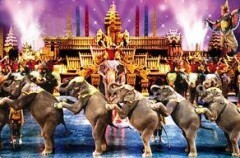 Fantasea is a combination of high tech special effects & traditional Thai culture, music and animals. A fantastic show, superbly put together. Regularly voted as Phuket’s No. 1 tourist attraction. * Children under 100 cm of height are free of charge, however they will not be provided with seats on the transport and in the theater..
Buffet Dinner at the splendid Golden Kinaree Restaurant. Admission into Phuket Fantasea entertainment park included. 15.00 – Start of pick up service at your hotel in Khao Lak – Pick up time to be advised on booking. 18.00 – 21.00 – Buffet Dinner at Golden Kinaree Restaurant fine cuisine. 22.45 – Transfer back to your hotel in Khao Lak. To us, ‘Thai’ is a story. A colourful tale of adventure, charm, fantasy and romance, lavishly spiced with mystery and magic. But words alone cannot define the richness found in many of the Thai customs and traditions. ‘Thai’ is best expressed in its most unique and eloquent form, through songs and dancing and of course, with a fun loving spirit. Phuket FantaSea is: a living tapestry of Thai history and culture, all woven together in one magical creation designed to share the extraordinary wealth of our heritage for all the world to experience.